UCL scientists have identified a key region of the brain that encourages us to be adventurous, but also makes us susceptible to advertising gimmicks and prone to addictions. The region is in a primitive area of the brain known as the ventral striatum and is activated when we choose unfamiliar options, suggesting an evolutionary advantage for sampling the unknown. Dr Bianca Wittman at the Wellcome Trust Centre for Neuroimaging at UCL led the study, which used functional magnetic resonance imaging (fMRI) scanners to examine volunteers' brains as they chose from a series of reward-based cards. When unfamiliar cards were introduced, the researchers found that the subjects were more likely to take a chance and select one of these options than continue with their familiar - and arguably safer - option. Dr Wittman said: "Seeking new and unfamiliar experiences is a fundamental behavioural tendency in humans and animals. "It makes sense to try unfamiliar options as they may prove advantageous. For example, a monkey who deviates from its diet of bananas may find its diet enriched and more nutritious - even if this involves moving to an unfamiliar part of the forest." And when we make a particular choice that turns out to be beneficial, it is rewarded by a release of pleasurable neurotransmitters such as dopamine. These rewards help us learn which behaviours are preferable and advantageous and worth repeating. The ventral striatum is one of the key areas involved in processing rewards in the brain. Although the researchers cannot say definitively from the fMRI scans how novelty seeking is being rewarded, Dr Wittman believes it is likely to be through dopamine release. It may also explain why re-branding of familiar products encourages to pick them off the supermarket shelves. "I might have my own favourite choice of chocolate bar, but if I see a different bar repackaged, advertising its 'new, improved flavour', my search for novel experiences may encourage me to move away from my usual choice," Dr Wittman explained. Rewarding the brain for novel choices could have a more serious side effect, argues Professor Nathaniel Daw, now at New York University, who also worked on the study. "The novelty bonus may be useful in helping us make complex, unfamiliar decisions, but it clearly has a downside," he said. "Increased novelty-seeking may play a role in gambling and drug addiction, both of which are brought about by malfunctions in dopamine release." To find out more about the Wellcome Trust Centre for Neuroimaging at UCL, use the link at the top of the article. 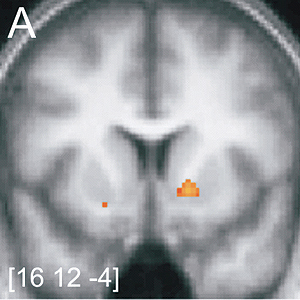 Image shows functional magnetic resonance image of ventral striatum activity during the Wellcome study.